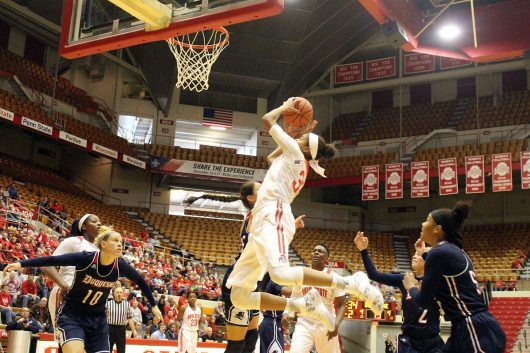 From the outset of Ohio State’s 89-69 win over Duquesne University on Friday, it was evident that the Buckeyes’ recent efforts to shore up defensive and rebounding issues paid off. OSU coach Kevin McGuff was unhappy with these two areas of his team’s play following a subpar exhibition performance against Ashland on Sunday. So much so that the Buckeyes worked almost entirely on rebounding and defense this week in practice. The increased effort and intensity was noticeable from the opening tip, as the Buckeyes used a full-court press to bother the Dukes throughout the game. Duquesne shot just 36.9 percent from the field and turned the ball over 15 times. “Coach was really harping on defense after last game, and I feel like we locked in and took the message and did a really good job with defense and rebounding,” redshirt sophomore guard Sierra Calhoun said. At times against Ashland, the Buckeyes played loose and weren’t as aggressive as McGuff would have liked on the defensive end. That wasn’t the case this time around. 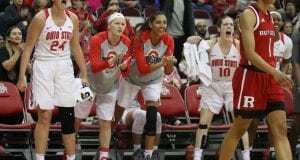 OSU also turned up its intensity on the boards. The Buckeyes were outrebounded 47-38 against Ashland, but they completely flipped the switch against the Dukes. OSU pulled down 55 boards and allowed Duquesne to grab just 33, and all 10 Buckeyes to see regular minutes grabbed at least two rebounds. 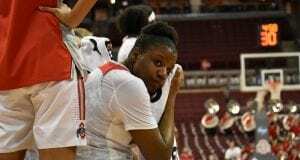 Leading the way was Mavunga, who attributed her 15-point and 14-rebound performance to the efforts of her teammates. “They were boxing out other players, so then that gave me the opportunity to go into the open gaps and get the rebounds,” Mavunga said. The Buckeyes’ defensive and rebounding efforts caused several scoring droughts for the Dukes that allowed OSU to pull away. To finish the second quarter, Duquesne made just two of its last 11 shots and scored just seven points in the final seven minutes of the half. Duquesne sophomore forward Kadri-Ann Lass buried a three-pointer 15 seconds into the second half, but OSU then used a flurry of scoring and defensive pressure to go on a 9-0 run and build a 55-29 lead. The Dukes pushed back, mounting a 13-4 run of their own, but the Buckeyes again clamped down defensively and outscored Duquesne 30-27 the rest of the way. The Buckeyes also used a balanced scoring attack to down the Dukes. 10 different players scored for OSU and four – junior guard Kelsey Mitchell (18 points), Mavunga (15), Calhoun (13) and junior guard Asia Doss (12) – were in double figures. Mitchell, despite scoring a team-high 18 points, struggled again from the field. She went 6-for-17 overall, including a 2-for-9 mark from three-point territory. Mitchell also struggled against Ashland, going 5-for-20 from the field and 0-for-8 from the three-point line. Despite the early season struggles, McGuff isn’t worried. The Buckeyes shot 44.6 percent from the field, including 27.2 percent (8-for-29) from the three-point line. The overall effort on both ends of the floor left McGuff feeling much more pleased than following the Ashland contest. 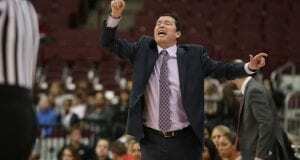 The South Carolina Gamecocks, a consensus top-five team that defeated the Buckeyes 88-80 in Columbia, South Carolina a season ago, will head to Columbus for a 6:00 p.m. tilt against OSU on Monday.